The GREY2K USA Education Fund is pleased to announce a brand new program to help greyhounds find homes and young children to gain reading skills. 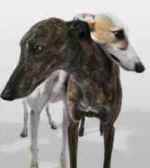 Greyhounds in the Library is a free "meet-and-greet" presentation that links kids with adoption groups across the country. Featuring a rescued greyhound reading from the illustrated book Pele's Forever Home by Darylynn Ayala, each visit is intended to help kids develop a true love for greyhounds. Read more about the program here. Gatherings are hosted by volunteers and their greyhounds at local libraries, at community centers and at other favorable locations. Information is provided about local adoption opportunities, and each child receives a free book and "Save the Greyhounds" wristband to take home. If you are a teacher, have an adopted greyhound or volunteer for a rescue group and would like to host a reading, please contact us for more information.